YouTube has unveiled details of its much-anticipated television streaming service, describing it as “live TV designed for the YouTube generation”. 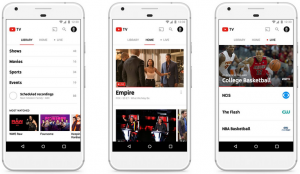 YouTube TV is set to go live “soon” in the US with a line-up of more than 40 channels, including the biggest US broadcast networks. The service will be available across devices, includes a cloud DVR with “no storage limits” for recording TV shows, and will cost US$35 per month without commitments – substantially cheaper than a typical US cable subscription. Live TV streaming will be available from ABC, CBS, FOX, NBC, ESPN, regional sports networks and “dozens” more cable networks including MSNBC, USA, Disney Channel and Fox News. Access to YouTube’s homegrown SVOD service, YouTube Red, is also included as part of the offering and users can add Showtime, or Fox Soccer Plus to their line-up for an additional charge. Announcing details of the service, YouTube said that membership comes with six accounts, each with its own unique recommendations and personal DVR. Users can record as many shows as they want simultaneously and each will be available to access for up to nine months. YouTube TV will be available soon in the largest markets in the US before expanding to cover more American cities. YouTube has not announced any plans for an international version of the service.